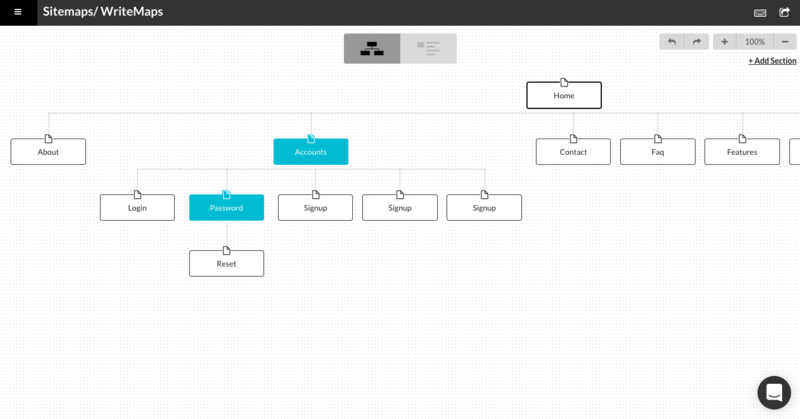 A sitemap generator streamlines or automates the process of creating a sitemap. That sounds handy right? But what is a sitemap? And do you need a visual sitemap, an XML sitemap, or both? … Okay stay tuned, while it sounds like nerdy water-cooler chat for web developers, the high level concepts here are actually pretty easy to understand. Below I’ll break down everything you need to know about sitemaps, and how to use a sitemap generator to save you time when building, redesigning, and maintaining websites. I’ve included some links to help get your sitemap sussed too. Read on! Visual sitemaps are used to communicate how the content of a website is organised. These are usually used by people working on a web project together such as web agencies and their clients, or to help various teams within a larger organisation define the scope of a web project. XML sitemaps are essentially a list of URLs so that a search engine can easily know which pages you want them to crawl and index. They are usually named sitemap.xml and found beside the index.html file in the root folder. Website platforms like Shopify and Squarespace will create these automatically. HTML sitemaps are for users visiting a website to understand where all the pages are, but they are less used these days except for sites with huge amounts of content. For search engines they have a lower impact on SEO than having a XML sitemap in place. Looking at this from a different angle, who uses which type of sitemap? People involved in a website project, whether internally in a larger company or in a web agency-client relationship, would use a visual sitemap right at the start of a web project to plan the information architecture of a site (how the content is organised). A visual sitemap gives clear direction to everyone involved in bringing a website to fruition (i.e. project managers, their clients, developers, designers, content writers, etc. ), by providing a high-level visual reference point of the website’s content structure. Right at the end of a web project they would deliver an XML sitemap (in the form of a sitemap.xml file) and possibly even an HTML sitemap as part of the final website. Sitemaps can also be created during audits or website redesigns, and are frequently employed for those purposes. 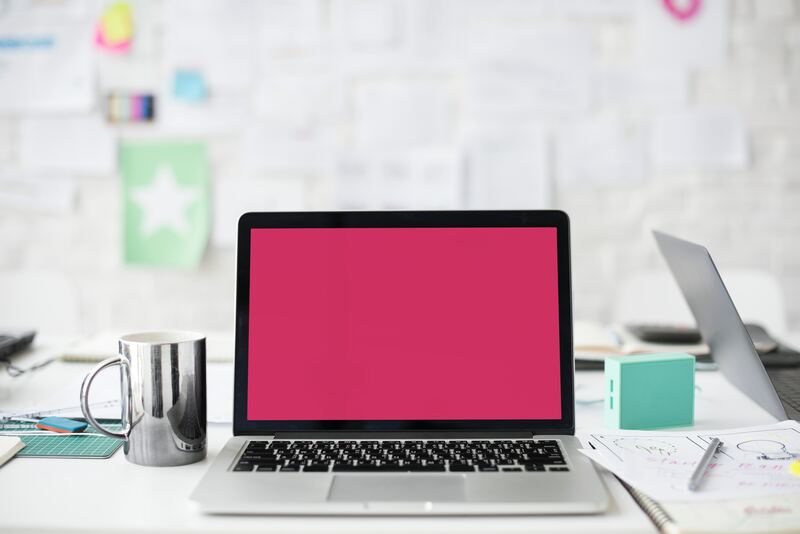 For visitors to a large content website, a well thought out HTML sitemap can be a backup option for them to find the content they want in fewer clicks. However, with current improvements in the usability of websites navigation and site search, the HTML sitemap is becoming less necessary. Search Engines like Google have bots that crawl the web to add webpages to their Index or ‘list of websites’. To crawl a single website a bot will default to following each link on a page until it has covered every page it can find. Or you can provide a handy dandy sitemap.xml file which is a list of all the pages that you want the bot to index (i.e. add to their list of websites). This all brings us to… How can I create a visual sitemap, or an XML sitemap, that will do it’s job well? What is a sitemap generator and how can it help me? B) Creating a sitemap.xml file for use on existing or new websites, by crawling a website. Other than sitemap creation, some sitemap generators can also validate a sitemap.xml file to make sure it has all the right code in all the right places. The idea behind this is to ensure you don’t trip up the search engine bots, so that they can index all the pages in your sitemap! A sitemap generator will save you a bunch of time by either creating the visual sitemap or sitemap.xml file far faster and with greater accuracy than you ever could manually. A sitemap generator automates the process of creating a sitemap, making it easier for you to create a sitemap.xml file or audit/redesign a website. How to generate a visual sitemap? There’s a bunch of visual sitemap generators out there. 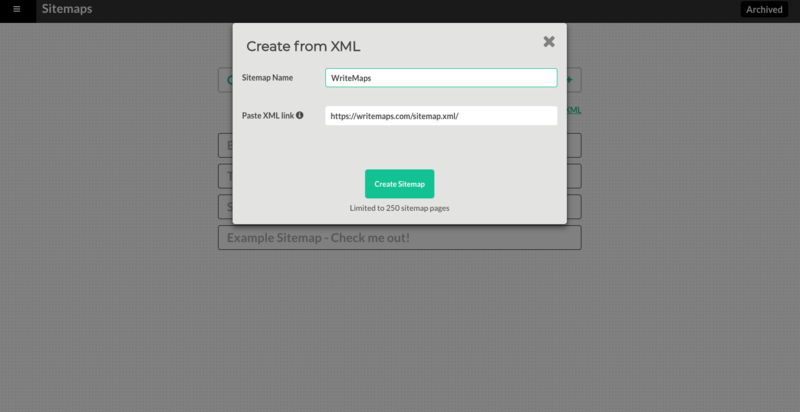 Here at WriteMaps when you sign up to a free trial of the Premium plan you can input the URL to your website’s sitemap.xml file, and we turn that into a visual sitemap for you to continue working with. Do I really need to add a sitemap.xml file to my site? The short answer is: unless you already have one, heck yes. Many website-builders, such as WordPress, Squarespace, and Wix, already auto-generate sitemap.xml files for you, so it’s worth trying to visit yourdomain.com/sitemap.xml or yourdomain.com/sitemap_index.xml to see if you already have a sitemap in place. If not, you can make a sitemap.xml file manually by reading all about them at sitemaps.org. The manual path will probably be time consuming, have lower accuracy, and requires technical knowledge of HTML and XML languages, … or you can just use a free sitemap generator like xml-sitemaps.com to generate it. If you’re on WordPress, one of the most popular plugins for creating XML sitemaps automatically is the Yoast SEO plugin. Have a search for that in the WordPress plugins marketplace. Once you have a sitemap.xml file on your site, you will need to submit it to Google Search Console. Let’s go over that again, real quick. There are three different kinds of sitemaps: visual sitemaps, XML sitemaps, and HTML sitemaps. If you don’t already have an XML sitemap, you can easily create one using an XML sitemap generator. It will help search engines to index the pages in your website so that you can start to rank in search results. User (HTML) sitemaps are generally only useful for larger websites with lots of pages and content. They make navigating around websites easier. A sitemap generator can save massive amounts of time and decrease the chance for human error when creating a sitemap. Well, thanks for stopping by! I hope this article has helped to give a basic understanding of various sitemap types and how sitemap generators are used.